very pretty ones. I laid on the bed with Gracie almost all the afternoon. Took "We Girls" & Mammas book back to the Library & got a volume of Scribners Monthlys. Played croquet in the evening at Mr. Richards. May & I are reading "The fair maid of Perth" by Walter Scott. We have not got very far yet but I like it ever so much. 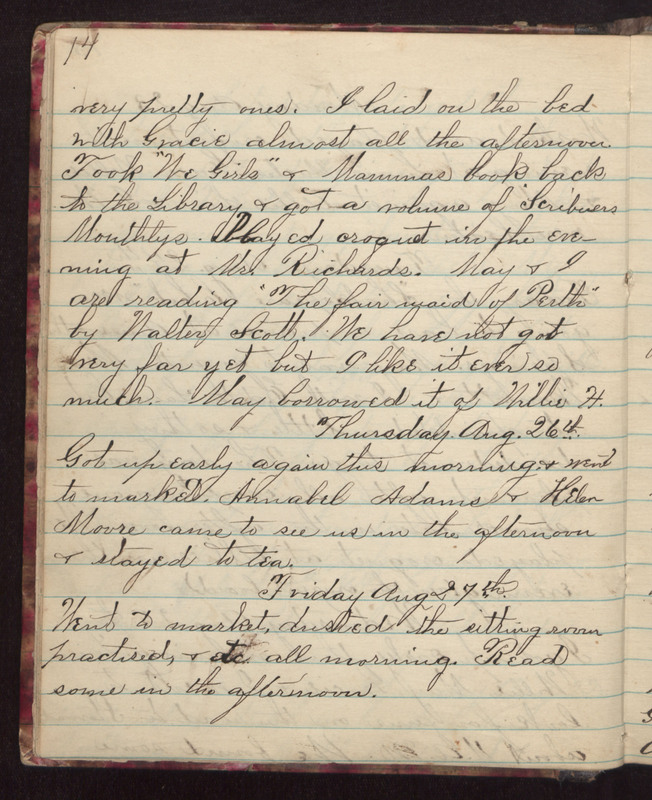 May borrowed it of Willie H. Thursday Aug. 26th Got up early again this morning & went to market. Annabel Adams & Helen Moore came to see us in the afternoon & stayed to tea. Friday Aug 27th Went to market, dusted the sitting room practised, & etc. all morning. Read some in the afternoon.